In this article, I will outline the main advantages linked to this type of workout. Also, I’d like to answer some common questions such as “what does the stair climber work?” or “how do you use a stair climber?”. I will even present to you my version of a solid. To begin with, stair climbing aims at enhancing your cardiovascular fitness. In line with a 2000 study that included sedentary women, a short-term stair climbing workout is linked with unique cardiovascular health advantages. Plus, a running steps workout implies more effort than running or walking. So, do stair climbers build glutes? Apart from the cardiovascular advantages, stair climbers also aim at strengthening the most important muscle groups in the lower body. So, what muscles do stairs work? The ones worth noting are the glutes, calves, your hamstrings, and quadriceps. Does climbing stairs tone thighs? Also, is stair climbing cardio or strength training? According to the American Council on Fitness, stair climbing works your legs better than running or jogging. So, walking up stairs utilizes your legs more laboriously, while working your heart, and toning and building muscle. Simply put: the higher the intensity, the higher the rise in your heart rate, and the harder your body has to work. That being said, stair stepper workouts could burn up to hundreds of calories. According to CaloriesPerHour.com, a 150-pound person could burn about 544 calories by climbing outside stairs. One of the many things I love about running stairs exercises is their convenience. 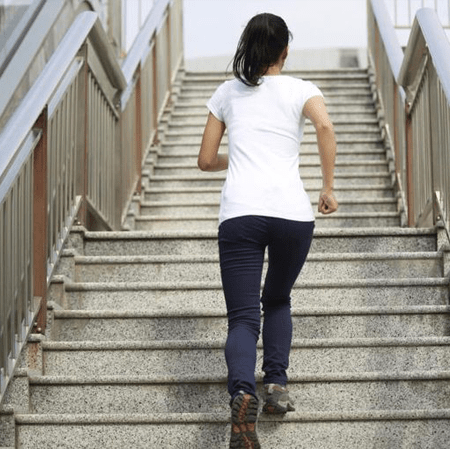 A typical running stairs workout burns a lot of calories in a short timeframe. That is convenient especially if your goal is to lose weight. Additionally, such exercises don’t require any equipment. For instance, you could also use your home stairs and still obtain promising results. My first recommendation is trying running up and down stairs. This will get your heart pumping, being a fantastic cardio exercise. Sports stadiums, business or apartment buildings have many stairs you could use for this. I would advise you start with a 10-minute session, at first. Afterward, rest for a little bit and then give it another go. Additionally, increasing the intensity of the exercise could maximize the cardiovascular benefits. 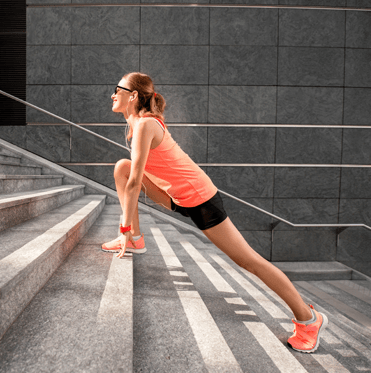 Using stairs to improve your performance at push-ups isn’t as weird as it seems. It is convenient, not to mention that these exercises target your core, arms and chest muscles. Here’s what you have to do. As you face the stairs, place your hands on the first or second step. Your legs should be extended so that they’re in a plank-like position. Also, as an extra tip: the higher the stairs, the easier it will be for you to do the exercise. So, as you maintain your hands at shoulder-width apart from each other, you should slowly bend your elbows, and lower your upper body. As you almost reach the stairs, hold your position for a few seconds and then come again to the starting position. If you’re still wondering how to do cardio at home, rest assured, this exercise will work your muscles. Once again, you’ll need stairs. Begin at the bottom of the stairs. The right side of the body has to be in the proximity of the stairs. Start with your right foot, and keep on running up the stairs sideways. Extra tip: Assume that your feet are chasing each other. Even though your right foot goes first, when the left foot is next, the right one should be ready for the upcoming move. You get the picture. If you want to target your legs and glutes, this stair walking lunge will do the job. Start by facing the bottom of the stairs. Put the right foot on the step, and lower both your knees while your body gets into the lunge position. Use your arms to keep your balance and keep going forward as you climb the stairs. If running down the stairs isn’t your cup of tea, you should try stair jumps or hops. These plyometric exercises will get your heart pumping, being great cardio exercises. Depending on your preference and fitness level, you could use either one leg or both legs. Bear in mind that using one leg is much more challenging. So, if you’re a rookie, you should wait a bit until you give this exercise a go. Stand in front of the stairs and afterward slightly bend your knees. Push yourself off the floor. You should aim at landing on the following step. So, keep on going for as much as you can. Extra tip: the stairs have to be deep. In other words, the stairs should easily accommodate your entire foot. Otherwise, you might land on edge. On a final note, even though stairwell steps exercises are excellent for both cardio and strength training, I advise you to alternate the workouts mentioned in this post with other exercises. This way, you avoid placing too much pressure and stress on your knees and joints. 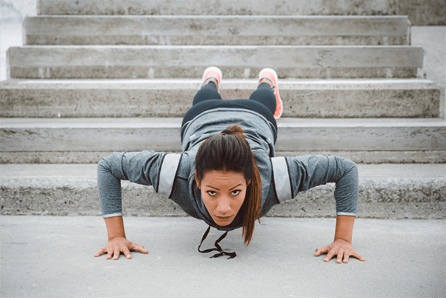 A stair workout could be conveyed as high-intensity training, which means you should give your body rest, allowing it to recover and repair since such workouts are physically demanding. In other words, you should always warm up before your workout, to prevent injury. Also, warming up after the workout will prevent muscle soreness.